Looking for a Private Restaurant Room or Private Dining in Toronto? Blu Ristorante promises to turn your next special event into a memorable experience with world-class private dining in Toronto. Whether you are looking to host a corporate function, business meeting, wedding rehearsal dinner, cocktail party, or a birthday dinner. Blu Ristorante has space for up to 110 guests (sit down dinner), and up to 160 guests (cocktail reception). The tastefully done interiors with imposing mirrors and beautiful stonewalls create a perfect backdrop for corporate events or special occasions. Whether you are looking for a formal sit-down dinner or a more casual cocktail party, we have you covered. Business meetings and corporate functions call for a special place that can boost your brand value and impress your guests. 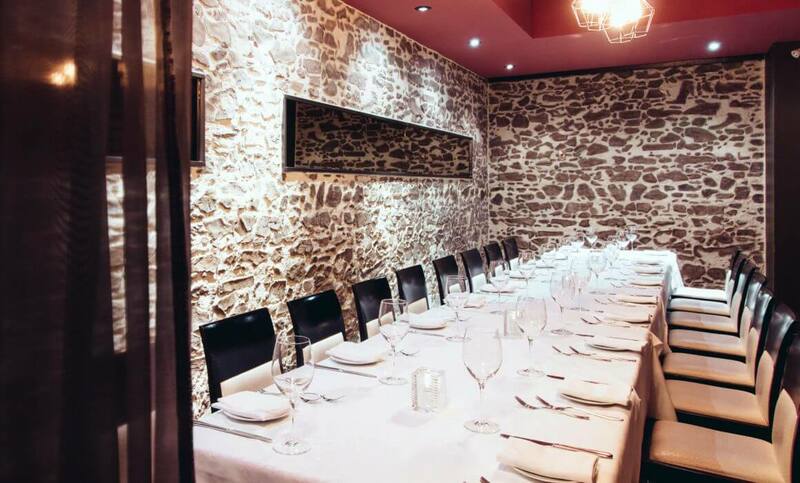 If you are looking for a private dining Toronto restaurant to hold your next business meeting or corporate lunch, BLU Ristorante can make your events successful. There are three well-appointed private dining rooms with different capacities. We also have a comprehensive audio-visual system that includes a good selection of speakers, projectors, microphones, podium, and lighting screens for your corporate events. Butterflies in the stomach just before the wedding? Wedding rehearsal dinners can help the couple-to-be take a break from the mounting stress and spend some quality time together. It’s also a good way to let the two families get to know each other in a relaxed environment and what can be a better place than one of our private dining rooms Toronto. We have tastefully furnished private rooms to make your guests feel at ease so you can make the most of your time together. Whether you choose it to be a sit-down event or a more relaxed cocktail party, we can accommodate your needs to make the event truly special. If a private dinner does not suit your event, we can also accommodate a private lunch. Since the restaurant is closed during the day, Blu can arrange private lunches for large groups with a full restaurant buyout available. As your guests walk into the restaurant, they will be greeted by an inviting and well-stocked wine bar with some of the best selections from around the world. Directly past the wine bar is the warm upscale dining room. We can accommodate sit down lunch event or standing cocktail reception. Are you looking for that perfect place to host your birthday party, a graduation party, or a baby shower? Whether you are looking for a large gathering or a small family affair, our private restaurant rooms Toronto can accommodate with ease. We aim to make your special occasions more memorable with our perfect ambiance, mouth watering delicacies, great drinks, and live music (available only on the weekends). We understand that every celebration is unique and the one size fits all does not apply, hence we offer private dining and private restaurant rooms that can suit all different occasions. Whether you choose a formal sit-down format or a more casual cocktail reception party, we are here to make it look great. Call Blu Ristorante for more details and plan your next event in style.